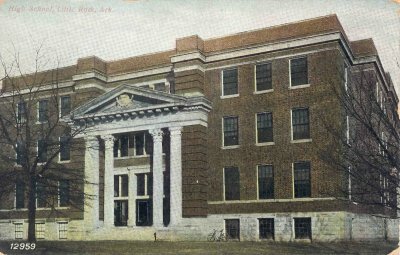 Photo: Postcard of Little Rock High School. Built in 1904, this school was built on the site of the old Scott Street School. The school had a telephone connection in each room, an extensive science laboratory, a shop class, modern heating and ventilation systems, electric lighting and the most modern plumbing (including water fountains throughout the building and showers in the gymnasium). Because of these furnishings, the school was considered to be one of the most modern high schools in the country at the time of its opening. In October and November 1904 the Arkansas Democrat held a contest for the naming of this new school at the suggestion of the school board. However, the board took action to name the building Little Rock High School before the official end of the contest on November 30. The winning name from the contest would have been Washington High School. 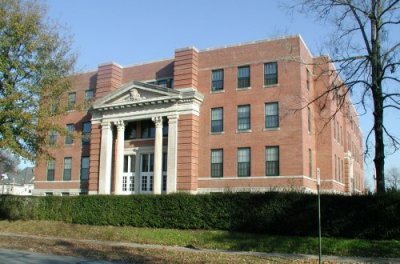 When the concept of the junior high school was initiated in the Little Rock schools, a new building was constructed to house the junior high grades (West Side Junior High, built in 1918). West Side was overcrowded from the start, and the overflow of students was housed at East Side. Junior high and high school students continued to share the building until Little Rock [Central] High School was completed in 1927; East Side continued to serve as a junior high school into the 1960s. East Side closed at the end of the 1963-64 school year; most students relocated to the new Henderson Junior High School. For a time afterward it housed the district's Adult Education Department. It is the oldest building still standing that housed Little Rock high school students. East Side served as a temporary home for the LRSD administration offices while a new building was under construction at 810 W. Markham Street. In 1965 the Little Rock Vocational School moved into the building where it remained until 1976, when the newly renamed Pulaski Vocational/Technical School relocated to North Little Rock. The building's Colonial Revival architecture combines the work of two major Little Rock architects of the early 20th century: Frank W. Gibb, who designed the school building in 1904; and George R. Mann, who designed the auditorium addition in 1911. The Arc Arkansas purchased the building, renovated it and converted it into 41 loft apartments for people with and without disabilities. The renovations were completed in January 2002. This building is listed on the National Register of Historic Places. "Washington High School" newspaper article (source unknown). Ca. December 1904. Article found in file containing J.R. Rightsell's personal papers.